Distance: how far can you walk in 20 minutes? Destinations: is everything you need on a daily basis within that distance? Density: are there enough people in the area to support the businesses and facilities you need for daily needs? Most planning commissioners and planners have heard much about walkable, livable communities in recent years -- including here on PlannersWeb and in the Planning Commissioners Journal. Susan Anderson, Director of Portland's Bureau of Planning & Sustainability, got into more detail about the city's 20 minute neighborhoods program at the International Making Cities Livable Conference in Portland a few weeks ago. 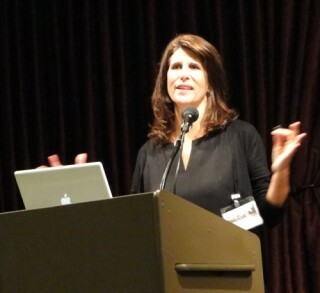 Interestingly, she immediately downplayed the "20-minute neighborhoods" title of her talk -- and noted that the Portland 25 year strategic plan (adopted last year) is "focusing a little bit less on the time frame of 20 minutes, and more on the adjectives: prosperous, healthy, connected, and high-performance." [One problem with the 20-minute neighborhoods moniker is that there are those -- seniors; people with disabilities; and others -- who either can't walk, or walk more slowly]. As Anderson explained, "what people want are jobs and prosperity; affordable housing; a healthy environment; and a city that connects neighborhoods." In many ways, all these are part of the fabric of the 20-minute neighborhoods concept. But let's step back for a minute for some background. Portland's population currently stands at about 600,000 (up from 437,000 in 1990, and 513,000 in 2000). "It's expected to increase by 280,000 over the next 25 years," Anderson noted, "and that means we need to plan for 130,000 more units of housing and for 140,000 new jobs." What's more, she added, "while we currently have 60 percent single family; in next 25 years, 80 percent of new housing will be multi-family." 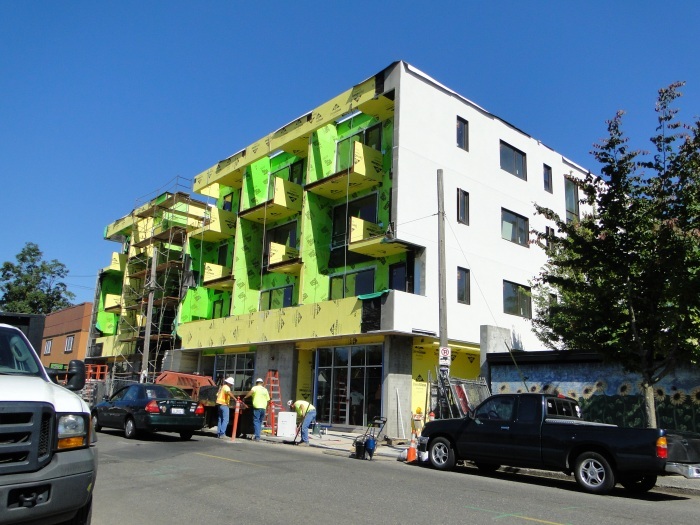 As in many cities across the U.S., Portland is focusing on promoting new housing, especially multifamily, along major corridors served by bus, streetcar, or light rail. Small commercial hub typical of Portland's older neighborhoods. 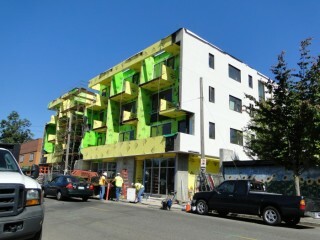 New mixed-use development along a bus route in southeast Portland. The Planning Bureau decided to take a closer look at local business district centers along its corridors and "look for ways of enhancing them." The result was a fascinating and comprehensive analysis of the city's neighborhoods (actually, 24 sectors of the city, some encompassing several neighborhoods). "It takes into account barriers to pedestrian access, such as topography (steep grades), rivers, freeways, and difficult street connections. The analysis also considers factors that enhance the walking experience, such as the presence of sidewalks, variety of pathways or connections, proximity to high-quality frequent transit, and the proximity to clusters of amenities." Here's the overview "hot map" from the report. Note that the lighter the color, the greater the area's accessibility / walkability. Click on each map below to view it at larger size in a pop-up window. 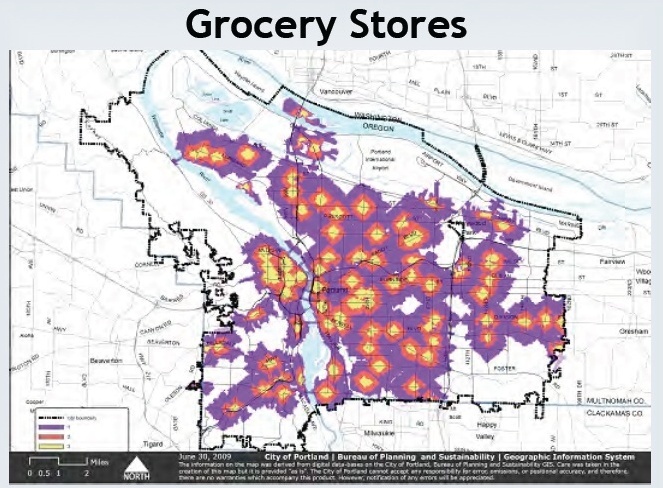 Take a look at a few of the individual maps focusing on some of the individual factors which are considering in determining a neighborhood's score. 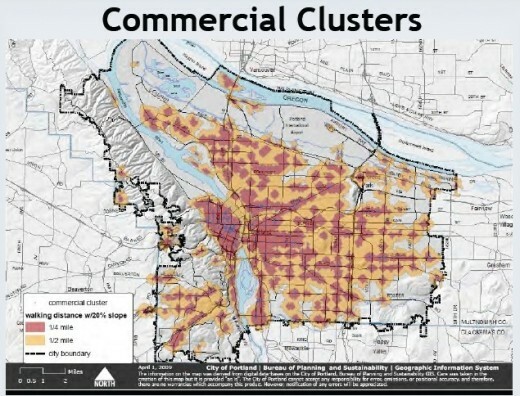 Proximity to commercial clusters. The red areas have highly accessible clusters; and the light orange areas, a moderate level of accessibility. On this map, the light orange areas have the best accessibility to grocery stores; followed by the red color areas. 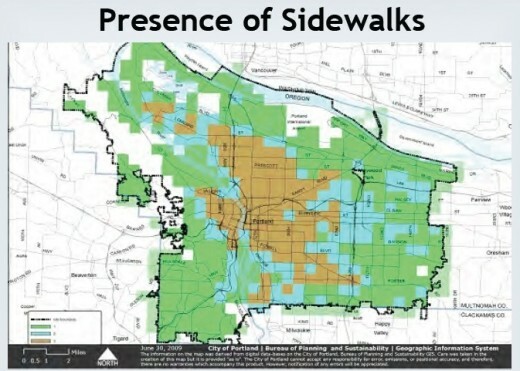 Here, areas with the most complete sidewalk network are shown in brown; with the light blue areas having the next best sidewalk infrastructure. For those of you who want more detail, the complete analysis and methodology can be downloaded from the City's web site (note: it's a large, 28MB pdf file). The aim, noted Anderson, is to use this information not just to highlight "successful" neighborhoods, but also point out "areas where we need to put more effort, and resources, into making them more walkable." Note: see my post "Another Side of Portland." While many parts of Portland have walkable, mixed-use areas (as seen above), other parts of the city reflect a more sprawling pattern (see below). Click on images to view at larger size in a pop-up window. While Portland does build new sidewalks when there's new development, sometimes they just end mid-block. The bottom photo shows what I found after I walked around the large shrubs at the end of the sidewalk. 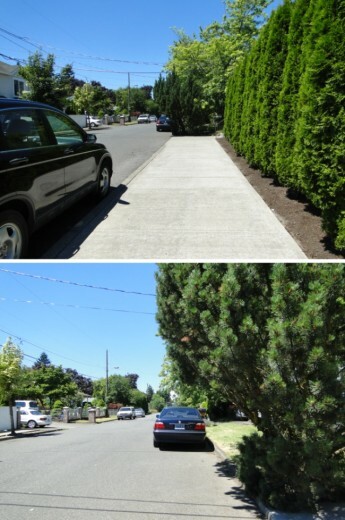 Many of Portland's newer neighborhoods have only scattered stretches of sidewalk. But what's the big deal about walkability? What's wrong with having people drive wherever they want, whenever they want? To be clear, Portland's plans and walkability goals are not coercive: no one has to give up their car, or walk, bike, or take the bus to anywhere they want to go. Instead, they're aimed at making life easier for those who do want to walk, bike, or use transit -- by strengthening those modes. 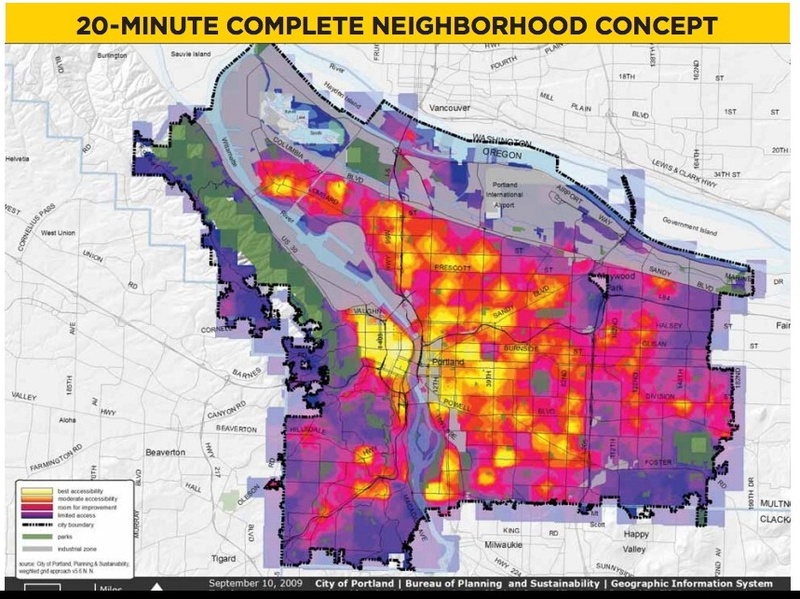 Important, too, the 20-minute neighborhood concept is aimed at meeting the broader strategic goals of Portland being a "high performance city." As Anderson explained, being a high performance city means being more energy efficient -- and lowering carbon emissions. And there's part of the rub: "we need to reduce carbon emissions by by 40 percent by 2030, and by 80 percent by 2050." Strengthening existing commercial hubs, and increasing accessibility to transit, both allow for people to get to more services they need without having to use their car. That's where big carbon savings will come from. 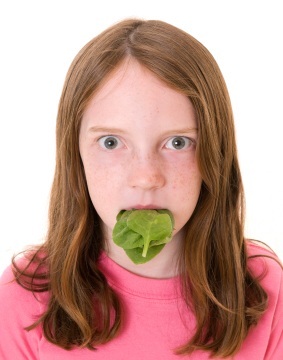 But it's not all "you have to eat your spinach." In fact, many people want more walkable communities, especially Millennials. That's part of what's been drawing so many young people to Portland. What's more, noted Anderson, there's another big benefit for Portland, "we literally have hundreds of companies who are now selling sustainable products and services; so sustainable development is not just a way of life, but a product line." In the next post, we'll first talk more about how Portland and the metro area are focusing on reducing greenhouse gas emissions; then I'll introduce you to four Portland planners who spoke to me about the successes -- and challenges -- in making neighborhoods more walkable.